To make this stocking, you will need: a felted wool sweater or wool felt, a dog template (see link below), scraps of wool felt (tan, white, pink, red and black), freezer paper, a glue stick, a water-soluble marker, black thread, embroidery floss to match the felted sweater or wool felt, black pearl cotton or yarn, mini pompoms, red yarn, ShrinkyDink film, and a red permanent marker. 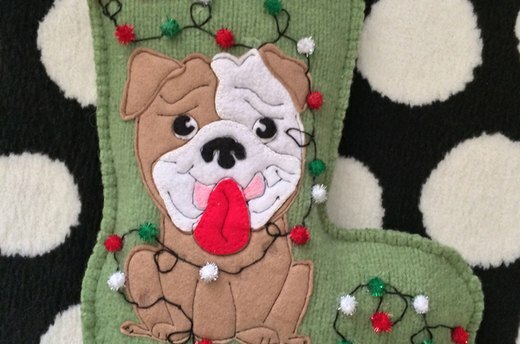 Cut out a stocking shape from a felted wool sweater or purchased wool felt. (See link below for a tutorial on felting a wool sweater.) If you’re using a felted sweater, place the stocking piece on the back of the sweater, right sides together, and cut a second piece. 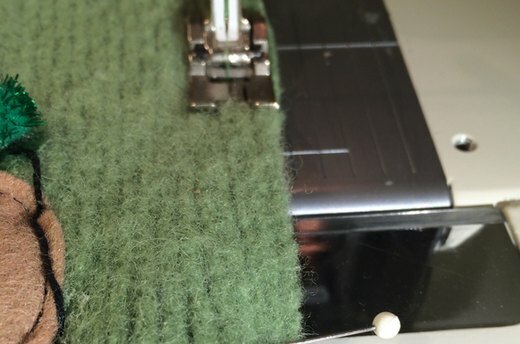 If you’re using wool felt, cut both pieces at the same time. Trace the face, forehead, muzzle, ears, nose, mouth, tongue and main body onto freezer paper. Iron the template pieces onto felt, using this image as a guide for color placement. Put glue stick on the back of the pieces and assemble the dog. Blanket stitch the edges of the features, if desired. 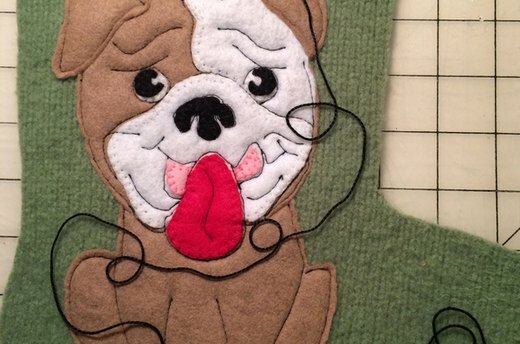 Use a water-soluble marker to make stitching lines for design details. 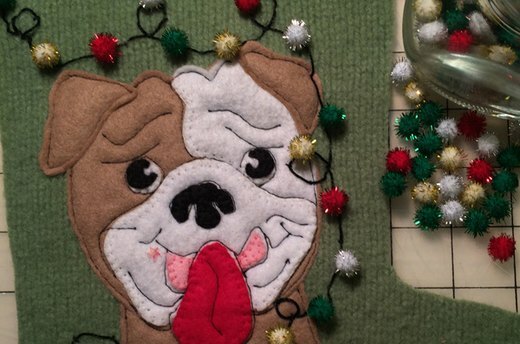 Put glue stick on the back of the assembled dog and position it on the front of the stocking. Press in place. 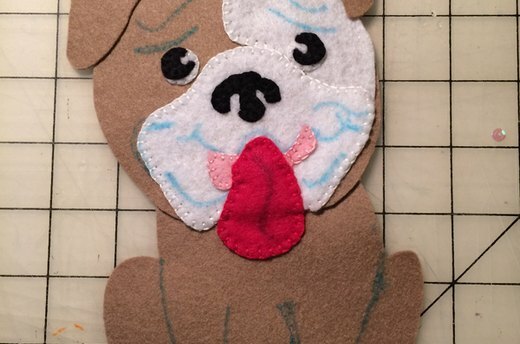 Using place thread, stitch around the outside edges of the dog, securing the dog to the stocking. Stitch on marked lines for design details. Lay out black pearl cotton or yarn. 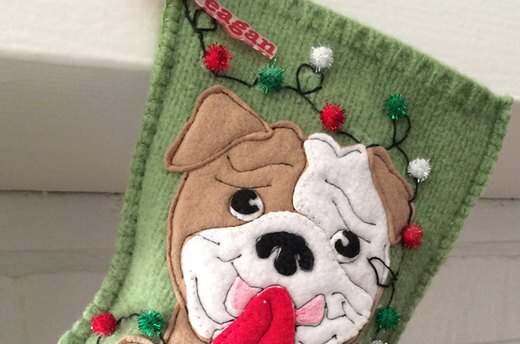 Start at the top of the stocking, down over the dog, and across the toe. Arrange the thread or yarn to look like a string of Christmas lights the dog has gotten into. Starting from the back, take a few hand stitches every inch or so, tacking the pearl cotton to the stocking. Place mini pom poms on the pearl cotton, positioning them to look like bulbs along the strand of lights. Stitch from the back or glue in place. Pin the stocking front to the stocking back, wrong sides together and all edges matching. Stitch around the perimeter, using a ¼-inch seam allowance. Blanket stitch around the stocking, using the first stitching line as a guide. Cut three 18-inch lengths of red yarn. Pin the yarn to an ironing board cover or other soft, stable surface, and braid about 7 inches, starting about 3 inches from the ends of the yarn. Fold the braid in half, tie a knot in the loose ends, and trim. 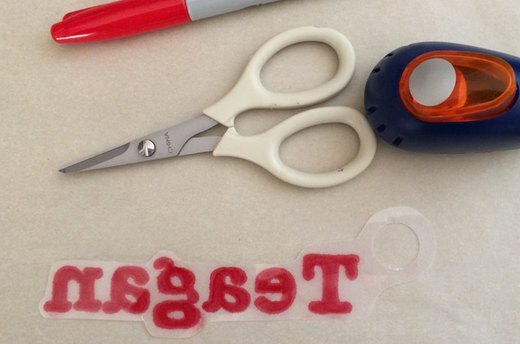 Use a permanent marker to write the name on ShrinkyDink plastic. Cut out or punch a large hole in the end, then cut out the plastic, following the shape of the letters. Place the ShrinkyDink, colored side up, on a cookie sheet lined with parchment paper. Bake at 325 degrees F for 1 to 3 minutes. Remove from oven and let cool completely. Option: embroider the name on a piece of white felt instead. 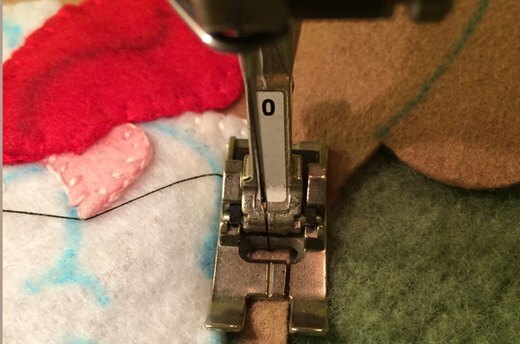 Starting from inside the stocking, take a few tacking stitches through the hole to secure the name to the top left corner of the stocking. Position the hanger so the tassle is slightly to the side of the name, and stitch it in place.